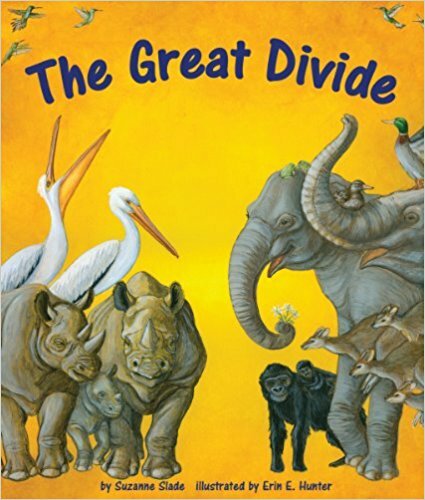 Are you looking for an engaging division read aloud with a follow up problem solving activity? Check out some of our favorites below and download the accompanying task cards by clicking on the underlined text in blue. After baking a dozen chocolate chip cookies for her children, Victoria and Sam, Ma is trying to wash the kitchen floor. As the children sit down to enjoy the cookies the doorbell rings and two friends arrive. 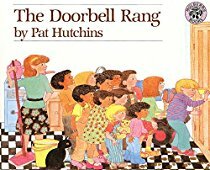 Each ring of the doorbell brings more and more friends to share the cookies until eventually there is only one cookie for each child … and then the doorbell rings yet again. Who can it be? Will the cookies need to be divided again? 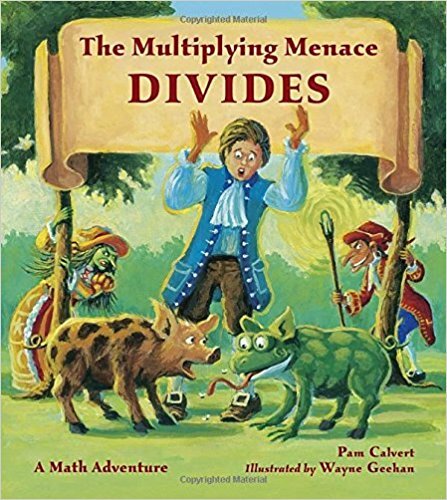 Hutchins’ quirky illustrations, including the expression on Ma’s face as she attempts to keep the floor clean and the children’s increasing dismay each time the doorbell rings, add to the text to make this division read aloud a beloved classic which invites problem solving and computation. Also available in a Spanish-language edition. Two crickets, Flora and Ralph, have gathered twelve beans for dinner. Against Ralph's better judgement, Flora picks a thirteenth bean. 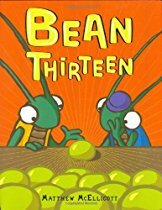 Unable to divide the beans evenly into two piles, Flora and Ralph decide to invite a friend and divide the beans into three piles, only to find that there is still one left over. Inviting a second guest does not help. Inviting a third guest makes the problem even worse. No matter how many guests they invite there is always one bean left over. How will they solve their dilemma? In this rhyming narrative a troop of twenty-five bugs is marching in a parade before the queen who demands that they have tidy rows with no remainders. The bugs try various formations but each time Joe finds himself “the remainder of one” and must stand aside. Joe's perseverance eventually pays off and he figures out a way for all twenty-five bugs to march before the queen in equal rows. 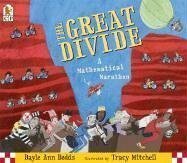 Follow up problem solving activities flow seamlessly from this popular division read aloud that illustrates the concept of division in the the context of arrays. If there were 18 bugs in the troop, how many different ways could they arrange themselves? What if there were 30 bugs in the troop? 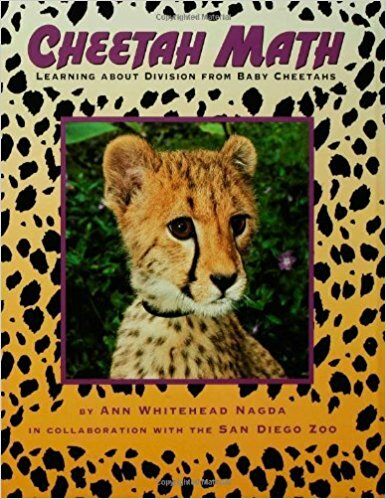 A 'must add' for your math literature collection. In this rhyming tale, eighty costumed participants compete in a cross country race that sees their numbers dwindle as with each new obstacle half are eliminated due to flat tires, whirlpools, and more. The halving continues until only five contestants are left, at which point "one runner stops with a rock in her shoe," enabling the final four to grab tandem bikes and continue on. In a surprise ending, the fifth contestant sneaks back to win the race. 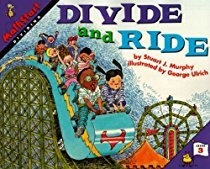 We’ve seen this division read aloud used effectively in a fourth grade classroom where students tracked each division on their dry erase boards as the story was read aloud. After the read aloud students selected a number between 20 and 100 and created a story map about that number of competitors in a cross-country race, illustrating the obstacles the racers in their story encountered and how many were left each time they divided into halves. 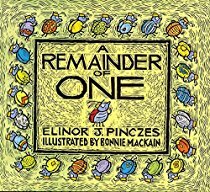 A fun read aloud for lessons focusing on the concept of using halving as a strategy for dividing by two.